The Shooting screen is where you work on your video. You can shoot clips, edit them, play your video and share it, all from the Shooting screen. Tap the Record button to start shooting a clip. Tap it again to stop shooting, or instead press and hold the Record button to shoot while your finger is held on the button. You can tap the Play button at any time to watch your video. Once you’ve tapped the play button it’ll turn to a pause button. As you shoot (or import) clips they’ll stay in order in the timeline along the bottom of the screen. Read more about the Timeline. Tap the [•••] button on the right end of your timeline to import video from your camera roll, or to paste a video from your pasteboard. See Editing Clips to find out how to copy clips to your pasteboard. The timecode shows you the length of your video. When you’re editing a clip it will show you the length of the clip, and while you’re playing it will show you where you’re at. You can switch to shooting mode and add additional clips by tapping the plus button in the lower right corner at any time. When you shoot a new clip it’ll be placed at the end of your timeline. Tap the Share button to open the share sheet. Read more about sharing. Vee recommends always shooting video in landscape. That means that your video is wide, rather than tall. 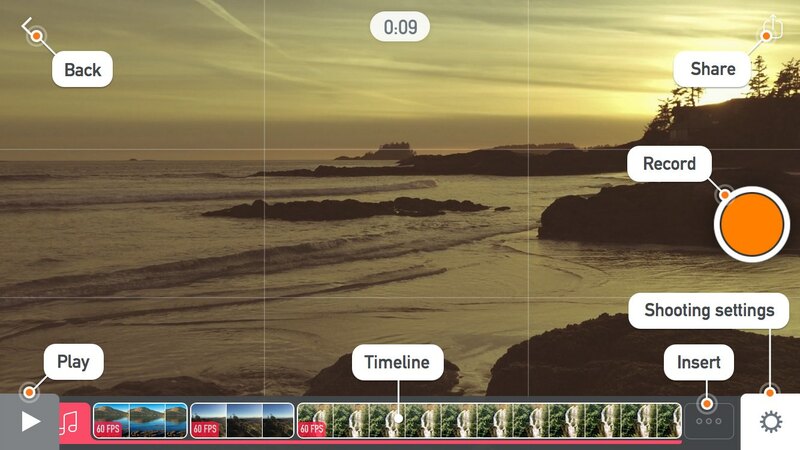 Landscape video is 16:9, and will look great on the web and on your TV. To remind you to shoot in landscape, Vee shows a “Portrait Shooting Warning” if you hold your device in portait while in shooting mode. You can still shoot in portrait, but we hope this warning will reduce the occurence of accidental portrait video. While you’re in shooting mode you can use the volume buttons on your device to start and stop shooting.